Submitted Photos Eleanor Wise recently celebrated her 100th birthday. Participants from Chautauqua Adult Day Services Westfield Center had something very special to celebrate. One of its participants, Eleanor Wise had a special birthday. 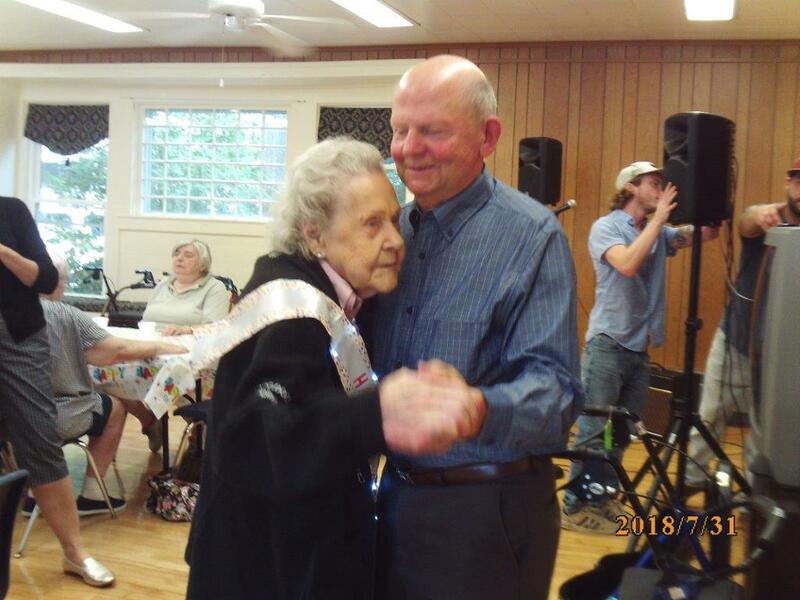 Eleanor celebrated her 100th birthday and everyone joined in and had a big party for her at the site. The Office for the Aging Westfield Dining Site joined the celebration along with her friends and participants at the Westfield Senior Day Program. Cakes By Brandy made a special birthday cake and Eleanor was joined by her son Jim Wise and Grandson Barkley Wise. There was dancing to music from Westfield’s Vintage Gold. She even received flowers from her niece Connie and nephew Skip. Being a centenarian is a special event and everybody enjoyed the opportunity to spend time with Eleanor. Eleanor has been attending the Westfield site since 2011 and is certainly the Matriarch of Honor. Chautauqua Adult Day Services offers senior day programs for adults 60 years of age and older who live in community. The centers provide socialization and offer many opportunities for clients to participate in activities during the day in a caring friendly atmosphere. Senior Day Programs provide supportive staff, supervision, meals, transportation, social work services, recreation, and companionship. In addition, the agency has a “Saturday Program” in Jamestown that focuses on participants being very involved in attending local events and outdoor recreation every week as well as eating home cooked meals. Chautauqua Adult Day Services, a United Way Community Partner and RSVP Volunteer agency provides an affordable option for older adults in the community to remain independent and at home. The mission of the agency is to provide an affordable day program that helps older adults remain independent and at home. For 35 years, the agency has provided day programs that enable seniors to have quality of life through socialization and activity programming. The sites provide breakfast, snack and a hot noon time meal for participants. There is also a Community Recreation Program that helps persons participate in outings in the community and the sites offer pet therapy, ceramics, music programs, arts and crafts and much more on an ongoing basis. Chautauqua Adult Day Services has four sites throughout Chautauqua County located in Westfield, Jamestown, and Dunkirk. One of its sites in Jamestown, the Present Center, is a program specifically for older adults with Alzheimer’s Disease. For information: visit www.seniordayprograms.com or call Westfield 326-6842 Dunkirk 366-8786 or Jamestown 664-9759.